As I read verse 7, there is was…my word for 2014…“still”. For the past several years, I have made the decision each year to choose a word that reflects something that God wants to do in and through me. I spend most of January praying about my word for the year. Once God shows me the “word”, I commit to going throughout the year watching as to how the word shows up in my life. When I see it or hear it, I stop and seek what God wants to teach my heart. So when the word “still” showed up for me in this verse, I knew it was time to stop and pay attention! First, I looked at the Hebrew meaning for the word still in this verse. The Hebrew word is “daman”. It means to cease (both in speech and motion); forebear; hold peace; quiet self; keep put to silence. When we are still and waiting patiently, we stop striving, pushing and forcing our own way. We don’t allow our emotions to rule our actions. Waiting patiently means that we are still…quieting ourselves…holding peace in our thoughts and actions. Enduring. Surrendering to His will, ways and timing! Easy to say and write – hard to put into action. Right?! We live in a society that teaches us loudly to want and expect immediate gratification, even in the simple things. Think about how easy it is to get upset when we have problems accessing the internet and have to wait. Think about when you choose the wrong line at the grocery store and wait longer than you wanted. Think about how much you are bombarded with advertisements that scream you deserve better than what you have and should have it now! Think about all the times God has placed you in a waiting circumstance and you have complained and acted in a bad mood. As I considered what this word means, I had to stop and think about times that I have not been “still”. The times I have become inpatient and complained, or chose to take action on my own in an attempt to resolve my wait. Can you relate to this? From our view, the wait can seem to be forever sustained and here is where it is so easy to complain and act angry or rash. When the waiting seems to have no end in site, it is so tempting to try and resolve it in our own way to simply get the waiting over with. When we are not being still our hearts will find it hard to submit to God’s plan. My dear friend, let me share with you truths that I am learning in my own life. God uses the wait to teach us things while He works out His perfect plan. Waiting can feel like an adversity. But in reality, this time of difficulty and hardship are oftentimes the very things that launch us into periods of intense spiritual growth. When we lay our “wait” at His feet, we learn to trust Him more and more and rely on His Sovereignty. Here is where we learn to find the joy in waiting on Him. These are things we can’t learn if there is no “wait” and if we are not still. As I was thinking about verse 7 this week – “Be still before the Lord and wait patiently on Him; do not fret when people succeed in their ways, when they carry out their wicked schemes” – the Apostle Paul came to my mind. Paul was put in jail by men who did not like that he was preaching the Gospel of Jesus Christ. God used Paul being in jail cell for several years to write half of the New Testament. There were attempts to carry out an evil plan, but Paul’s stillness allowed Him to share the Gospel not just with the people of His day, but with the rest of us who have lived in the past 2,000 years. All because He waited and was still before God! 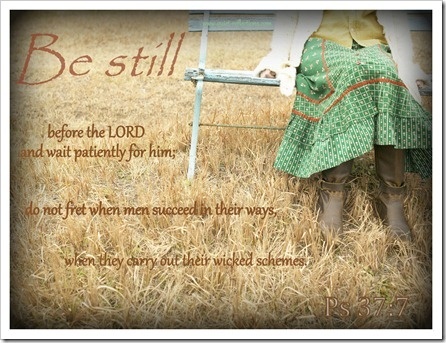 How are you obeying these commands in verse 7 to be still and wait patiently? What attitude are you expressing to those around you? Do they see a heart surrendered or one that is angry, fretting and worrying? Do they see a gentle and quiet spirit or an ill-tempered spirit that is grumbling and complaining? Do they see one who is still or running ahead of God to fix and remove the hardship? Remember that people are watching you. When we commit our way to Him and obey His commands, He will “make your righteousness shine like the dawn” (verse 6). As you are still in your waiting circumstance, God is not only working in your own life, but He is allowing others to see glimpses of Him as well! This is just one way to offer yourself as a sacrifice to Him for all He has done for you! I have been listening to the following songs this past week, allowing the words to encourage me in my moments of stillness….